Circa 1983, our family Christmas picture (with my mom taking the picture). This is probably one of my favorite Christmas pictures as you can see by the beam on my face as my parents bought my first pony with her young colt that year. My love of horses continues as my own daughter shows horses. 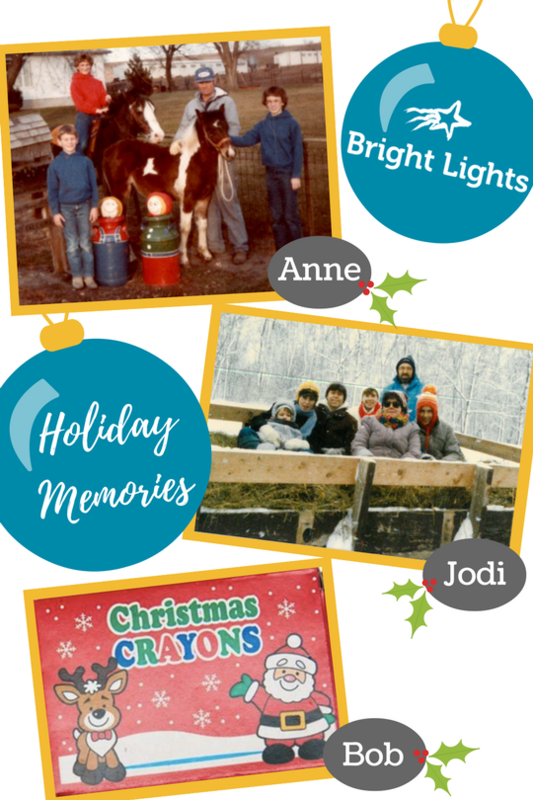 Over one Christmas break in the ‘80s my parents arranged for us to take a sleigh ride in the Kettle Moraine Forest at one of my favorite horseback riding ranches. It was freezing cold, with wind chills below zero, but we bundled up and went anyway. The “sleigh” was a wagon with hay bales inside and runners beneath. I am pictured second from the left. In 1979, I was 12 years old and celebrating Christmas Eve at my grandparent's home in Norfolk, Nebraska. I recall me, my sister, and my cousins sitting around the tree after dinner (always Chili & Rocky Mountain Oysters --- if you are not familiar with this, Google it! --- soup on Christmas Eve). As I opened several gifts, I recognized a theme of writing and drawing materials. As I laid those materials out, it dawned on me...and I announced to my family, "I'm going to grow up to be a teacher!" I’ve been blessed with many great holiday experiences, but one of my favorite is from early elementary school and was the year my Grandma got me a much desired stuffed Cheer Bear Care Bear. Keep in mind that this present was much desired by MANY kids that year so they were NOT easy to find! But she somehow got me one and it was well loved and traveled with me everywhere for many years. My daughters were 5, 3, and 13 months and it was the first year the Kindergartner participated in the Christmas Eve church program. On December 23rd, the 3-year old was diagnosed with bronchitis and given antibiotics; the 13-month old followed very early the morning of the 24th with bronchial coughing and the doctor had already prescribed a dosage for her the day before. By evening, we set Grandma up to sit with the two younger girls while Daddy and Mommy went to the church program with the oldest. We were all proud of the part she played in the service and we all opened presents when we returned home. But around midnight the 5-year old joined the two younger ones in her bronchial coughing and I spent Christmas Eve through Christmas Day sitting on the couch holding all three girls sitting up on my lap so they could breathe as they slept. Although it was difficult, I will never forget the Christmas of 1985 with my three girls. We lived about 5 hours away from my grandparents and they couldn't attend our school programs, so my brother and I would sing the songs for them when we visited at Christmas. My grandpa would record us every year and then we'd listen to the entire tape and laugh and reminisce about years past. We also had a tradition of watching the Orange Bowl with them on New Year's Day - the Huskers never seemed to win that game but we Iowans were still faithful fans!